When you try to log in, if you use User Name = Mickey and Password = Mouse, the frmMain form should open with all links visible. If you use User Name = Minnie and Password = Mouse, the frmMain form should open with only the Salary Calculator, View Personnel, and Search options available. You will have a new option called Manage Users that will allow you to add new users and remove or update existing users. Once you have verified that it works, save your website, zip up all files, and submit in the Dropbox. Note on database connections: We are using a SQLDataSource control for the Edit employees feature that we added. You should be using the connection string stored in the web.config file for your database connection for this control. Rather than creating a new connection each time, just use this connection. If you change the folder where your website is stored (e.g., you copy each week’s work to a new location), you will need to update the web.config. The advantage of using the database connection in the web.config is that you only have to set the configuration in one location. Before starting this week’s lab, make sure that everything is working and that all database connections are properly configured. 1. In order to do this lab, we need to assign a primary key to the tblUserLogin table. This will allow us to modify the user login table from our Manage Users form that we will create later. Go to Windows Explorer and open the PayrollSystem_DB.accdb. Set the UserID as the Primary key and save the table. Close the database. 2. Open Microsoft Visual Studio.NET. 3. Click the ASP.NET website named PayrollSystem to open it. 4. Create a new Web form named frmLogin. 5. 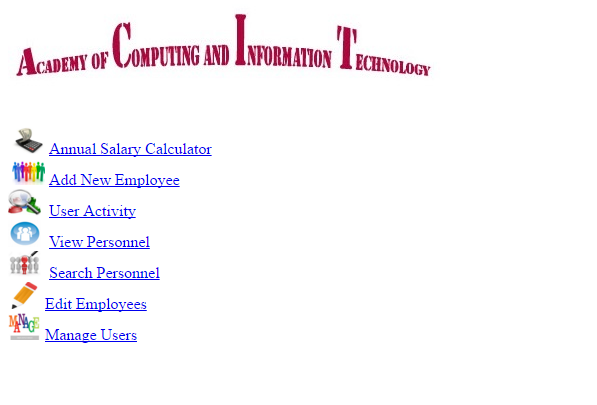 Add the ACIT logo to the top of the frmLogin page. Do not hyperlink the logo. TitleText	Please enter your UserName and Password in order to log in to the system. 7. Highlight everything in the form, then click Format, Justify, Center. Save your work. 8. Go to the Solution Explorer, right-click on frmLogin, and left-click on Set As Start Page. Then run the website to check if the Web form appears correctly. 9. Create a new DataSet called dsUser. Use the table tblUserLogin as the database table for this dataset. Do this in the same way that you added datasets in the previous labs. 13. Set the start page as frmLogin.aspx. Run the website. Try to log in with both User Name = Mickey and Password = Mouse and User Name = Minnie and Password = Mouse. Any other user ID and password should not allow you to log in. 14. When the user logs in, we want to restrict what they can see and do based on their user role. The role is stored in the database table tblUserLogin. Mickey Mouse has all privileges, whereas Minnie Mouse has read only privileges. We want to control the visibility of the links on the frmMain page. 17. You now have a Web application that honors the role of the logged-in user. We don't have a way of managing the user roles and users in the system. 18. Add a new form called frmManageUsers that will allow the user to add new users. The user will also need to be able to view all users and modify or delete any of the users in the database. Add a main form option called Manage Users that is only accessible to admin users. Add the link and image buttons as we have done in the past. 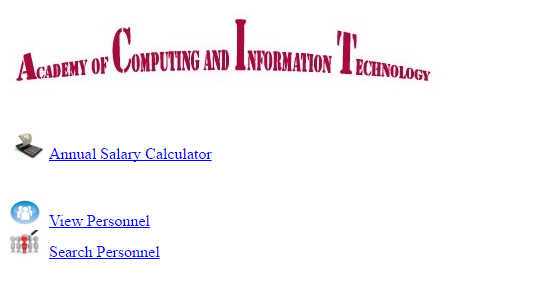 Add the ACIT logo that is hyperlinked as you did in previous assignments. 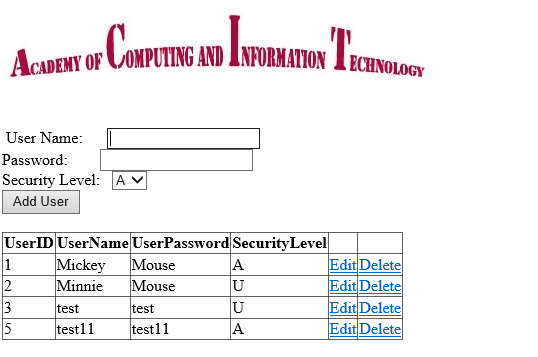 •	For the security level of the user, use a dropdown list control to allow the user to select from A or U. •	Name the controls with names that make sense. When creating the SaveUser function, be sure to insert the data into the tblUserLogin table with columns: userName, UserPassword, and SecurityLevel. •	Make sure you reestablish your database connection if you copied the files from a previous lab. •	You can turn a control on or off by setting its Visible property. •	You can add a data entry form for new users and a grid displaying all users all on the same form. 20. Test your application to make sure that you are logging in with a valid user ID. Try to log in with both Minnie and Mickey and make sure that the UI adjusts by the role properly. Make sure that you can utilize the Manage Users functionality to Add/Modify/Delete and view user information. Once you have verified that everything works, save your project, zip up all files, and submit in the Dropbox. NOTE: Make sure you include comments in the code provided where specified (where the " // Your comments here" is mentioned); also, any code you write needs to be properly commented, or else a 5-point deduction per item (form, class, function) will be made.